Back in February, after I had posted about Banh Mi Hot Ga Op La (Vietnamese French Bread with Sunnyside-Up Eggs), I received an email from a reader asking for a dish of sunny-side-up eggs served with Vietnamese French bread on a small metal plate with a bit of broth, diced tomatoes, and a few meatballs. I thought he might have been describing Bo "Ne" Bit Tet (Vietnamese "Stand Back" Beef Steak). The "stand back" is my rough translation of ne. Anyone got a better translation for this dish? Miss.Adventure in Vietnam simply calls it bo bit tet and ate it in Saigon. I've only seen and eaten this in the South Central coast of Vietnam. My relatives called it bo ne because you have to ne when the sizzling hot cast iron plate comes out to the table. The photo above was from my last trip to Vietnam. I think of it as the Vietnamese equivalent to the American steak and egg breakfast. Bo ne was a frequent breakfast item. On the South Central coast, it was priced between $7,000 to $8,000 VND, or the equivalent of $0.40 to $0.50 cents USD. Ah, see, that was prior to blogging. If it were now, I would have taken a closer picture of the whole breakfast, showing the head of the cow cast iron plate. Anyway, what you see is a Xiu Mai (Vietnamese Meatballs), a small piece of beef steak, the remnants of a fried egg, a lone French fry, homemade mayonnaise, and lots of beefy juices. Served with a loaf of Vietnamese French bread to sop up all that juice, of course. Anyway, so it's time for another assembly recipe! I realize my version doesn't look nearly as juicy, but that's because I haven't poured the Maggi Seasoning Sauce on the eggs yet. And the meatball came from the freezer. If it had been fresh I would have poured the meaty juices over everything. Seriously? You need a recipe recipe? 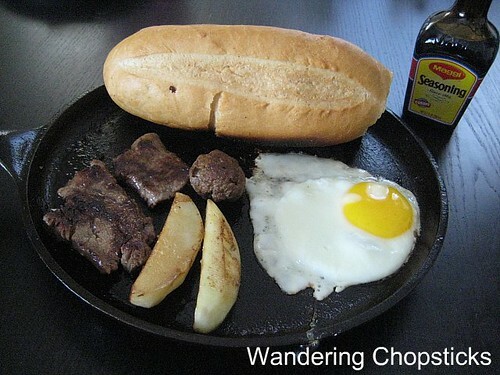 Pan-fry the steak and eggs and potatoes all at the same time on a cast iron plate. Add a dollop of pate or mayonnaise. The pate is so yummy when it's warm and melty. Pour meatball sauce over everything. Mop it all up with Vietnamese French bread. 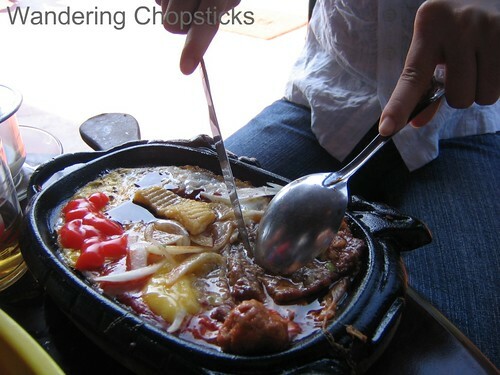 Can you hear the sizzling? Stand back so it doesn't splatter. Now you know how this dish got its name. 1 year ago today, Fried Rice with Hot Dogs, Eggs, and Ketchup. ::drool:: that used to be my weekend treat if I was well behaved during the week. Don't you need do chua as well? You should swing by MonAmi on the corner of Euclid and Hazard in OC. They have a really fancier version using fillet mignon. I always get the bo ne with pate sauce as if the steak and eggs alone wasn't enough. Really? I've never eaten it served with do chua. That would just be too odd. Ah, I remember you mentioned that restaurant before. Ha! Gas prices are too high for me to "swing by" OC!